A Chinese aviation company, AVIC International, which is eying a stake in Air Tanzania, has launched a technical support centre in Dar es Salaam. The China Oversea (Tanzania) Civil Aircraft Technical Support Centre aims at facilitating the Chinese civil aircraft fleet in Africa. 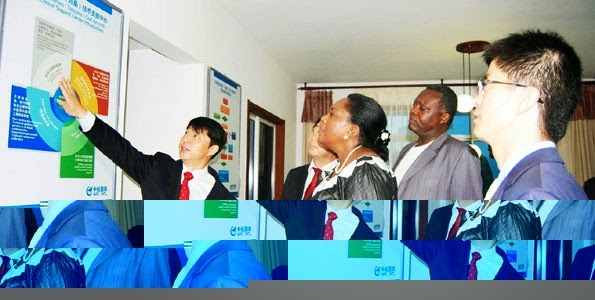 The AVIC International Managing Director of Civil Aircraft Department, Dr Li Song Lin (left), briefs the Deputy Permanent Secretary in the Ministry of Transport, Monica Mwamunyange (third right) on the company’s operations during the opening of the China Oversea (Tanzania) Civil Aircraft Technical Support Center in Tanzania in Dar es Salaam over the weekend. Others are Executive Vice President of AVIC International, Dr Zhang Guangjian (second left), Director of Infrastructure from EAC Secretariat Mr Philip Wambugu (second right) and the Charge de’affair at the Embassy of China in Tanzania, (first right) Mr Li Xuhang. It will provide efficient and on-time field support, technical services and spare parts supplies for the aircraft. The company is also having discussions with Air Tanzania Company Limited (ATCL) to establish a joint venture and provide the Tanzanian firm with the Chinese civil aircraft for operation. The deputy Permanent Secretary in the Ministry of Transport, Monica Mwamunyange said at the launch of the centre in Dar es Salaam at the weekend that the opening was part of implementation of issues agreed upon by leaders of the two nations. “It was part of what is contained in a Memorandum of Understanding (MoU) between the governments of Tanzania and China - sealed in Beijing in October, this year during the visit by President Jakaya Kikwete to China,” she said. The MoU sought to expand and deepen cooperation between the countries. “It is interesting that this is happening before we officially finalize a Joint Venture deal between AVIC and ATCL,” she said. The AVIC International Executive Vice President, Dr Zhang Guangjian said the China Oversea (Tanzania) Civil Aircraft Technical Support Center in Tanzania (Dar es Salaam), is also a step forward for the firm’s commitment to establish its customer service network in Africa. “Going by our future cooperation plan with ATCL, we will also build other centers like a spare parts pool, a flight training facility and a Maintenance, repair and operations,” he said. In her speech, the Deputy Director General of West-Asia and Africa Department in the Chinese Ministry of Commerce, Xie Yajing, termed the move as a great start and meaningful milestone for aviation cooperation between the two Countries. “The Ministry of Commerce of China fully supports AVIC International and its cooperation project with its Tanzanian partners, with favorable policy and financial support. I believe their cooperation will significantly benefit transportation industry, tourism and the social and economic development in Tanzania,” he said. ATCL Acting Chief Executive Officer, Captain Milton Lazaro, said the alliance between his airline and AVIC was aimed at enhancing domestic and regional air network within Tanzania and Africa as well as the whole world. "Through such cooperation, we are very sure that even the number of our aircraft is going to increase and be able to expand services," he said.